On 25 March 1918 at Eterpigny Ridge, France, Captain Toye displayed conspicuous bravery and fine leadership. He three times re-established a post which had been captured by the enemy and, when his three other posts were cut off, he fought his way through the enemy with one officer and six men. He counter-attacked with 70 men and took up a line which he maintained until reinforcements arrived. 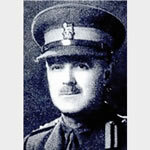 In two subsequent operations he covered the retirement of his battalion and later re-established a line that had been abandoned before his arrival. He was twice wounded but remained on duty. Publicly available records at United Grand Lodge only currently extend to 1921. As a 20 year old near the end of the war, it is more than likely that Alfred joined Freemasonry in the post war period and after 1921.